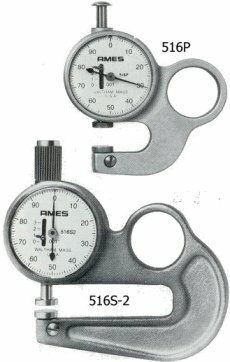 The most popular series of Ames dial mikes. Compact - fits easily in your pocket. Extra rugged and accurate because Indicator is built into the gage. Linear counter reads the revolutions of the indicating hand. Has decimal English-Metric conversion chart on back. Available with 1" or 2" throat depth and four types of gaging action (see last column), including Ames clutch type screw- down. Metric models available. A series with the same features as the 516 series, but with an indicator graduated in .0005" for greater magnification. Available in two styles, either with lifting lever or the Ames clutch type screw-down (next column). Your choice of English or Metric models. Lifting Lever - available in both series for easy retraction and gaging under constant, positive pressure, free of operator influence. Push Down - 516 series only. For fast or gaging action when checking non-compressables. 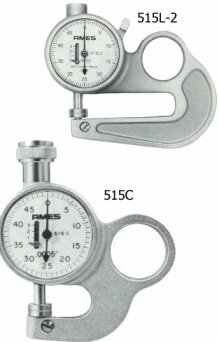 Screw-Down - 516 series only - same type of action as regular micrometer. Clutch Screw Down (Standard for series 515, operational for Series 516) velvet smooth clutching action for precisely controlled gaging pressure (10 ounces nominal) independent of operator influence. Dial Diameter 1 3/8" 1 3/8"
Contacts (flat) 3/8" dia. 3/8" dia. Average Weight 7 oz. 7 oz. Clutch Screw-Down : Also available separately to convert Models 516S or 516S-2 in use. Specify 6165. Any model in 516 and 515 series may be equipped with special contacts for checking grooves or odd shaped sections. Throat Depth 1" 2" 1" 2" 1" 2" 1" 2" 1" 2" 1" 2"